Understanding variables and limitations in a tightly controlled process can lead to color stability. 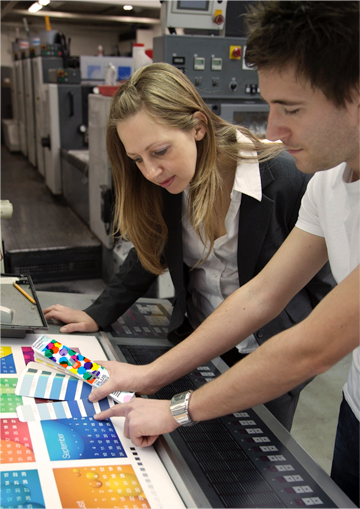 GMG offers many software solutions that can help printers and converters manage color. ©2016 GMG. Bruce Bayne has a favorite analogy when contemplating the printing process. Running a press, he says, is a lot like being behind the wheel of a car. Printers, much like motorists, should always be making minor adjustments as they operate. “Just because the road is straight, can you close your eyes?” Bayne asks. “The car isn’t made perfectly. It will not drive straight even if you lock the steering wheel. You will always veer off either left or right and we have to keep it on the road.” With more than 40 years of experience in the industry, Bayne has established himself as one of printing’s foremost color experts. As the president and founder of Portland, Ore.-based color management consultancy Alder Technology and the mind behind the SpotOn! Press software suite, Bayne explains that he looks at color tolerances as the edges of a road. When sharing his knowledge of color management and process control, his goal is to keep the operator between the lines, no matter what the device or application may be. The Pantone Extended Gamut Guide provides color options beyond the capabilities of CMYK. Bayne explains that when improving color management, he likes to look at the task from a process control perspective. He explains that printing has often been viewed as a craft, with skilled craftsmen needed to run the machinery and adjusting accordingly as variables present themselves. While Bayne says he does not want to remove the craftsmanship and skillset needed in running a press, monitoring variables and looking at printing as more of a manufacturing process can help keep color in check. 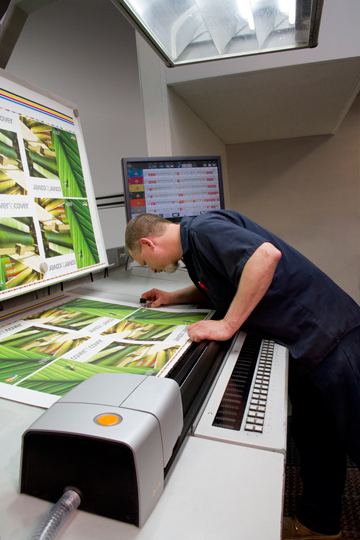 In addition to environmental conditions, the variables of each printing process need to be considered. Marc Welch, director of strategic accounts for GMG Americas, a color management software supplier, explains that color management strategies will differ between printing processes that have different variables. For example, Welch explains that to help reduce the variables in the offset process and also in high-speed aqueous inkjet printing, a printer can use gray component replacement. Once the process variables are reduced, Welch says the window for deviation will shrink, making it easier to apply a color management strategy. Reducing variables is critical to printing the same colors on different devices, but there also must be an understanding of the limitations of a press’s color gamut. This knowledge can help a converter make educated decisions on what colors can be feasibly reproduced. 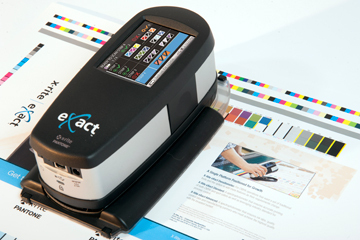 Use of a spectrophotometer, such as the eXact from X-Rite, can help package printers manage color. To reduce the impact of differing gamuts, Welch explains there are methods that can be implemented to disguise the potential problems that varying gamuts can create. One strategy that GMG has developed, Welch says, involves printers actually using two gamuts at the same time on the same press. The first gamut, he explains, is the full gamut of the machine. The second is the visual reference being used, such as the General Requirements for Applications in Commercial Offset Lithography (GRACoL). Welch says the CMYK colors get mapped into the GRACoL gamut. This creates a precise match of the GRACoL images on both printing processes. Then, any spot colors that are outside of GRACoL, such as a brand color, are mapped into the full gamut. This is the optimal use of all of the gamut available on both printing processes. By printing this way, Welch explains that images will look the same because they will be mapped to the GRACoL gamut and the spot colors are as good as they can be within the limitation of the specific process. Understanding what each press can produce provides a guideline to the converter as to which colors will or will not match. This knowledge can then be used to set proper expectations with the customer before the job hits the pressroom. Bayne explains that hitting accurate spot colors in a conventional process like flexo or offset is easier than with a digital device. For example, Pantone’s Reflex Blue is a notoriously difficult color to print, but in a conventional process, the printer is using a spot color ink mixed in that specific color. And, Bayne says, by implementing one of SpotOn!’s products like SpotOn! Flexo, a converter can tell precisely how close he or she is to matching that spot color and what might need to be adjusted to get closer. 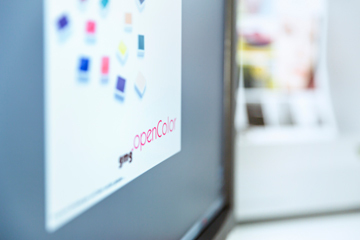 GMG OpenColor is a software solution that proofs profiles for package printing. ©2016 GMG. Attempting to simulate spot colors in a digital process using CMYK inks inherently introduces additional variables and challenges. Bayne explains that printers should be selective in what spot colors they attempt to match digitally, as many are outside the range of what a digital device can produce. So while a flexo or offset press can utilize ink already mixed to the correct spot color formulation, a digital device can only come as close to matching it as its available colors will allow. However, Bayne says one exception is with aqueous inkjet printers that are often used for photography or fine art prints. These printers have a larger gamut than offset or flexo presses, which can be particularly useful during proofing. Color matching across multiple output devices is hardly the only challenge that converters face when trying to accurately represent a brand. In addition to multiple devices, colors frequently need to match across multiple substrates and applications. For example, Iain Pike, packaging product portfolio manager for X-Rite, the parent company of Pantone, explains that color will reproduce differently on varying substrates, such as coated paper, carton board, clear films and flexible packaging structures. To help printers and converters quickly access guidelines to produce Pantone colors in these varying applications, the company offers a cloud-based system called PantoneLIVE. As part of this solution, Pantone master color standards are mapped out and accessible based on the inputs provided in the printing process. For example, inputting the substrate, inks and printing process being used will result in a dependent color standard for that specific combination. “This winds up producing results that are well coordinated and optimized without a lot of headaches or the costs associated with trial and error or rework when the color doesn’t match between two different processes or two different substrates,” Pike says. One of the advantages of having this reference tool located in the cloud, Pike says, is that it helps to set expectations prior to going to press. For example, he says by referencing PantoneLIVE dependent colors in the art files in prepress, PantoneLIVE can then provide proofs that feature the color results for a flexographically printed label and an offset printed folding carton. By being able to produce these results in the proofing stage, Pike says a substantial amount of work is reduced for the converter and brand owner. Time and material are not wasted through color matching on press, proofs don’t need to be mailed back and forth between sites, and conversations about feasible color reproduction can be reduced because the results are available so far in advance. Intellitrax from X-Rite provides automated color management for press side control. Another goal for PantoneLIVE, Pike explains, is to help converters reduce their color inventories. As converters grow their color libraries, oftentimes they add colors that are nearly identical, but with only slight numerical differences in their measurements. With PantoneLIVE, a converter can measure a color outside the Pantone range and the software will respond with the Pantone color it most closely matches. Then the converter and brand owner can decide if that color can be implemented instead. Pantone also recently announced the release of the PantoneLIVE Private cloud, which can store proprietary colors outside the Pantone range for easy accessibility in any software that connects to PantoneLIVE. While the road of color control winds through several twists and turns, Bayne says two concepts remain at its core. Through a deep understanding of how a press prints over time and the variables that can come into play that may alter a color, printers can be more proactive, rather than reactive, when it comes to color. It’s a culture change that Bayne says printers will need to accept. But making process control part of their day-to-day operations will lead to improved performance.